Practicing yoga with kids is a wonderful way to see yoga through another lens. Kids are not often worried about how they look in a pose or scared to try something new. They tend to have more flexibility than adults and an uninhibited desire for fun. This serves them well when taking yoga to the next level. Once kids are interested in yoga, it is important to keep them invested. One way of doing this is by introducing new and exciting poses. This pose can be extremely elusive for adults, even those who were able to do a full split as a child. Many kids can already do a split, but introducing it in a yoga class encourages them to try something a little different. We don’t want our kids to jump into a spontaneous split like they might on the playground. Instead, we want to work up to this pose through a series of hip and quad stretches to prepare the body to enter this extreme pose safety. After properly warming up the body, come to a Low Lunge. From there, begin to slide the front foot forward and the back foot back, until the legs are completely straight. If the child can’t get into the pose fully, they can stop at Ardha Hanumanasana (Half Splits) with the front leg straight or use blocks under the pelvis to support them. Working continuously on this pose is a great way to show kids how they can progress and achieve things they didn’t think they could do! This pose is fun, for anyone, but especially for kids. It requires a good amount of upper body strength, so it is a good pose to introduce after a few months of practice. From Down Dog, extend the right leg high in the air. Then bend the right knee and reach the right foot towards the left hip. Then, keep reaching the foot towards the ground until it falls under the left hip and the torso is rotated towards the ceiling. Extend the right leg long, keeping the foot on the floor, and reach the right arm long beyond your head. This pose opens the heart, shifts perspective, and usually makes people laugh -- all of which are great things for kids to do. 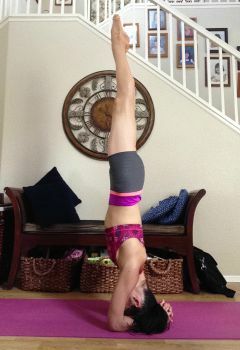 Headstand is another pose that scares adults and excites kids. They tend to have no fear about hanging out upside down, and probably have already tried some sort of Headstand. In yoga, we practice Headstand carefully, and this is a good lesson for kids to listen to their body. Headstand is less about standing on your head, and more about supporting your head with your hands and arms. To get into this pose, start by kneeling and placing the forearms on the ground with the fingers interlaced and the elbows about one forearm length apart. Then, bring the head into the hands so the crown of the head is on the ground and the hands provide a supportive basket. Then, come on to the toes pushing the hips high. Start walking the feet in towards the head, eventually kicking one leg up and then the other. It is a good idea for kids to practice this at the wall first so they don’t topple over and injure their necks. Like Wild Thing, this pose gets the blood flowing to the brain and is a great way to help kids focus. This pose is a balancing pose with a twist (literally). Kids love practicing Tree Pose, and Eagle takes things to the next level. Rooting down into the right foot, cross the left leg over the right, then wrap the left foot behind the right shin (so the legs cross twice). Then, swing the left arm under the right and twist the forearms so the palms touch. This pose requires kids to listen very carefully to directions, which is a great way to gain attention and get them focused. They’ll work very hard to achieve balance in this pose and enjoy the challenge that Eagle provides. This is a funky pose that puts the body in an unnatural, but not altogether unpleasant position. Kids will enjoy the challenge of getting their feet behind their heads. From Shoulder Stand, start to lower the feet behind the head until they come to the floor. Extend the arms away from the body resting the palms on the floor. This pose has wonderful health benefits as it stimulates the lymphatic system and organs. Of course, this won’t be of interest to kids. They will, however, find an exciting new way to flip themselves around. Introducing these next level yoga poses to kids is a great way to challenge them in their practice, but also a good way to teach them to be gentle and aware of their body. If they try these poses without properly warming up the body or without supporting themselves in the right way, they could easily get hurt. Teaching them to take their time getting in and out is a great lesson of patience. Beyond all that, these poses are fun and will keep kids coming back for more. 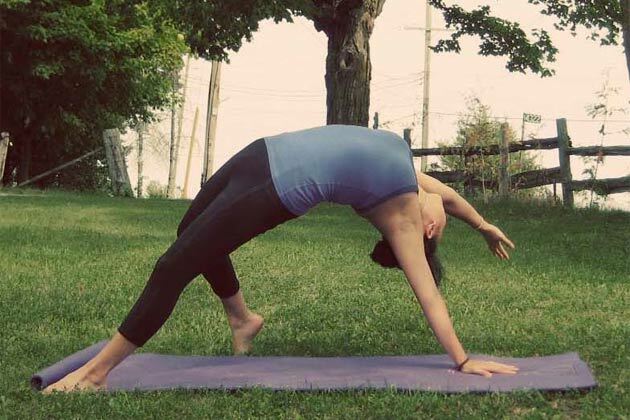 Have you tried any of these poses with your kids yoga class? How did they like them? Share with us below!